I argue that one’s views about which “metaphysical laws” obtain—including laws about what is identical with what, about what is reducible to what, and about what grounds what—can be used to deflect or neutralize the threat posed by a debunking explanation. I use a well-known debunking argument in the metaphysics of material objects as a case study. Then, after defending the proposed strategy from the charge of question-begging, I close by showing how the proposed strategy can be used by certain moral realists to resist the evolutionary debunking arguments. I am grateful to Robert Audi, Jeff Brower, Ross Cameron, James Darcy, Dustin Crummett, Torrance Fung, Kirra Hyde, David Mark Kovaks, Derek Lam, Kris McDaniel, Andrew Moon, Sam Murray, Sam Newlands, Fr. 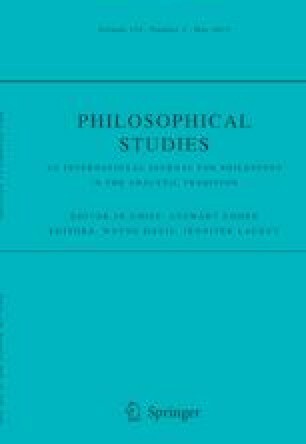 Phillip Neri-Reese, Mike Rea, Nick Rimell, Aurora Raske, Noel Saenz, Jeff Snapper, Rebecca Stangl, Adam Tiller, two anonymous referees for this journal, and audiences at the 2016 Virginia Philosophical Association meeting, the APA Central 2017, and Notre Dame’s Center for Philosophy of Religion paper workshop for helpful discussion. I am especially grateful to Dan Korman, Trenton Merricks, and Peter Tan, all of whom multiple drafts of this paper and provided me with invaluable feedback, advice, and discussion. Dan gave excellent comments on an earlier draft of the paper at the APA and gave me lots of helpful advice before and after our session. The paper’s current framing, and most of the material in Section VI, are a direct result of his comments and advice.